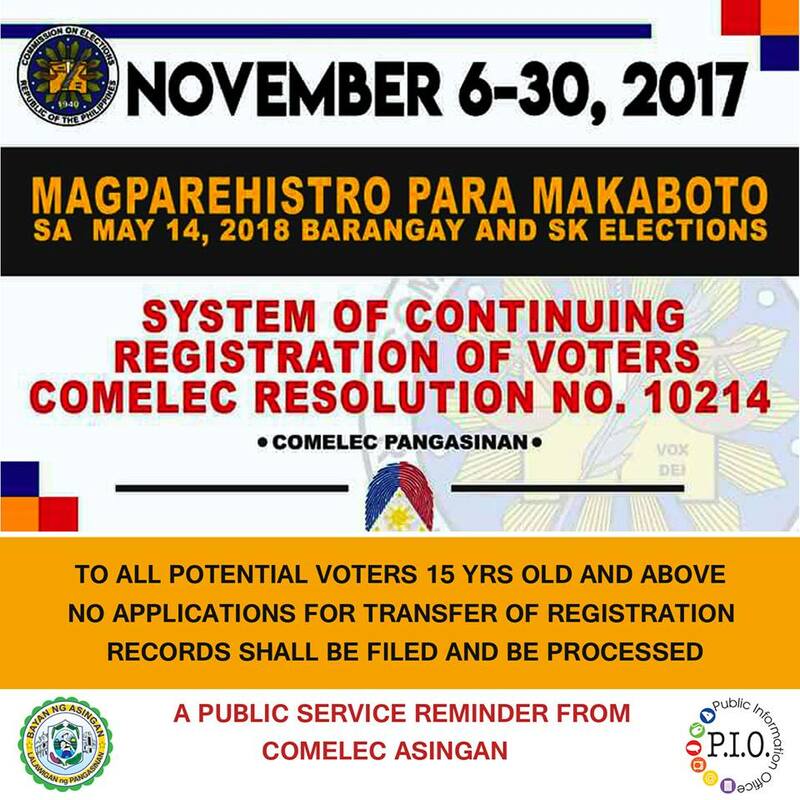 COMELEC Asingan to resume voter’s registration on November 6-30. Asinganians can register as voters from November 6 to 30, the Commission on Elections (Comelec) Officer Mrs. Leny M. Masaoy said. Applications must be personally filed before the Offices of the Election Officer in the municipality where the voter resides, from 8:00 a.m. to 5:00 p.m. on Mondays to Saturdays, including holidays. Filipinos at least 15 years of age and residing in their barangay for at least six months on or before the polls on May 14, 2018 may register as voters for the SK elections. No applications for transfer of registration records shall be filed and be processed. Comelec issued Resolution No. 10214 on October 24, scheduling the resumption of voter registration after the barangay and Sangguniang Kabataan (SK) elections were postponed once again until May 2018.